“Large-scale commercial harvests are believed to have reduced the population to 50,000-100,000 animals in the mid-1950s (Fay et al. 1997). The population appears to have increased rapidly in size during the 1960s and 1970s in response to harvest regulations that limited the take of females (Fay et al. 1989). Between 1975 and 1990, aerial surveys were carried out by the United States and Russia at 5-year intervals, producing population estimates ranging from 201,039 to 290,000. Based on evidence of changes in abundance, distributions, condition indices, and life-history parameters, Fay et al. (1989; 1997) concluded that the Pacific walrus population increased rapidly in size during the 1960s and 1970s, and postulated that the population was approaching, or had exceeded, the carrying capacity of its environment in the early 1980s. Figure 1. 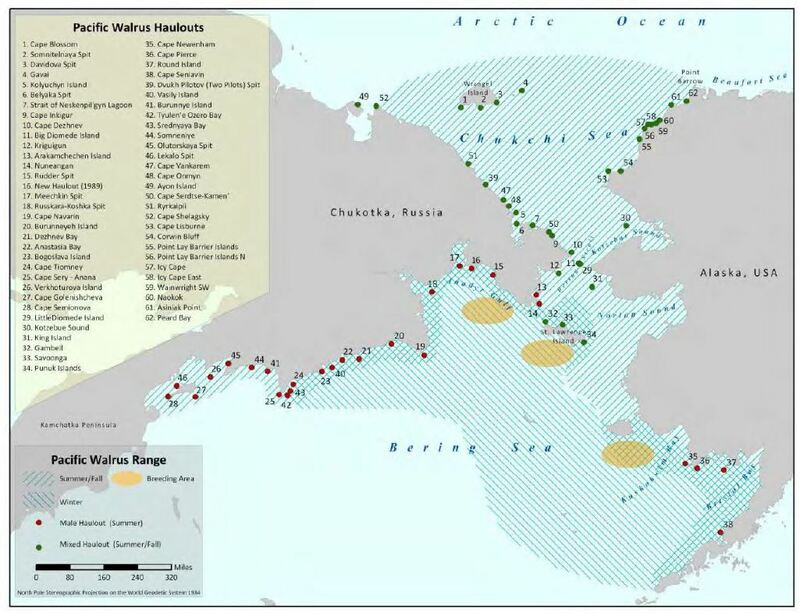 Walrus haulouts by season, from the 2011 status report (Garlich-Miller et al. 2011). Click to enlarge. 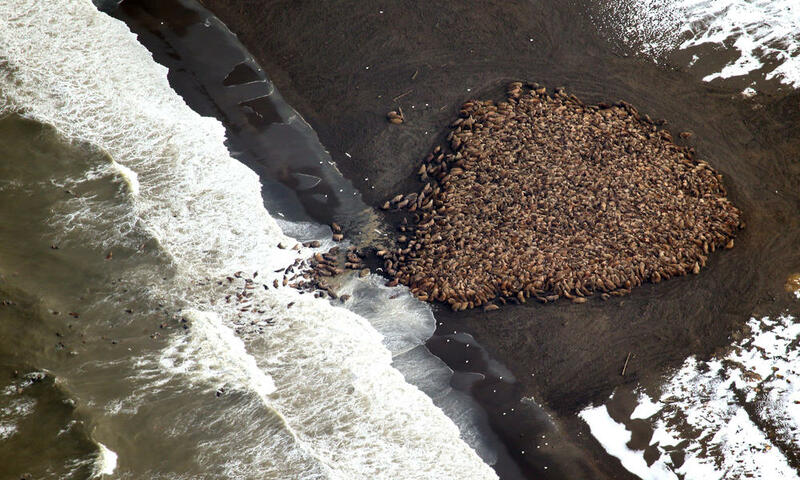 “… in the next two decades [after 1960] the walrus population recovered again, at least doubling in size. By 1980, it already was showing density-dependent signs of having approached or reached the carrying capacity of its environment. As productivity and calf survival declined sharply in the late 1970s and early 1980s the catches more than doubled. We believe that the combined effects of natural curtailment and human intervention may be bringing the population down again rather rapidly. The steady increase was indicated also by the fact that the animals gradually reoccupied nearly all of their former range, including some areas that had been vacant for up to 100 yr (Fay et al. 1986). census data, the relative increase of the population appeared to be at least 100% between 1960 and 1975. (a) The animals were significantly leaner in the 1980s than they had been in the late 1950s to early 1970s (Table 1; Kruskal-Wallis test, P < 0.02). This suggested that either the food supply had diminished or the animals were expending more energy than before to get it (or both). (b) The occurrence of seal flesh in the stomach contents of animals taken in the Bering Strait region in spring was unusually high in the late 1970s (Lowry and Fay 1984), and we found that other alternate prey such as fishes, anemones, and polychaetes, also occurred more frequently than before (Fay and Stoker 1982a, 6; Fay et al. 1984). Seal flesh diminished in frequency of occurrence in the samples after 1979, but the presence of parasites acquired from eating fishes remained high. From 1975 to 1982, the bivalves found in the walruses’ stomachs were of diminishing size in each successive sample, suggesting that selective predation was changing the structure of the prey populations. That is, having expanded into essentially “virgin” range, some of which had been unoccupied for more than a century, the walrus population finally appeared to be exerting a detectable effect on its primary food supply in the central part of the range and was taking increasing amounts of alternate prey. A very large population may behave differently than a smaller one: the propensity for females with young calves to gather together on land (keeping together helps defend against polar bear attacks) may backfire when there are very large numbers of them. When walrus female and calves haul out in large groups, a stampede can kill large numbers of calves and weaken adults — it’s happened recently but it also happened in the late 1970s, when the population was also very large (Fay and Kelly 1980). Walruses may not be food limited yet, I haven’t checked that literature, but they may still be exhibiting other signs of a very large population size, like hauling out together on remote beaches or moving from one area to another in late summer and fall to find more productive food sources. Large population size now and in the late 1970s — not lack of sea ice — is a common denominator for the phenomenon of huge herds of females and calves hauling out on shore in late summer and fall. It may not be the only commonality, but large population size is almost certainly a significant factor contributing to these events. Fay, F.H., Kelly, B.P. and Sease, J.L. 1989. Managing the exploitation of Pacific walruses: a tradegy of delayed response and poor communication. Marine Mammal Science 5:1-16. PDF HERE. This entry was posted in Advocacy, Sea ice habitat, walrus and tagged carrying capacity, Chukchi Sea, climate change, females and calves, global warming, haulouts, mass gatherings, mass mortality, polar bear prey, sea ice declines, stampede, walrus. Bookmark the permalink.